To be fully functional in today’s society, you have to possess digital literacy — the knowledge of using computers in the many ways they enhance our work, home, school, and entertainment. Being digitally literate means you know the handiest tricks for surfing the web, keyboard shortcuts to get stuff done fast in Windows 8, and more keyboard shortcuts to help you work efficiently in Word and Excel. Knowing some basic web search words and symbols (or syntax) will speed up an Internet search, whether you’re using Google, Bing, or other search engine. If you use the following five tips with your search words or phrases, you’ll quickly find the precise results you’re seeking — and improve your digital literacy! In Windows 8, you can hone your digital literacy by using just one key — the one with the Windows logo on it. 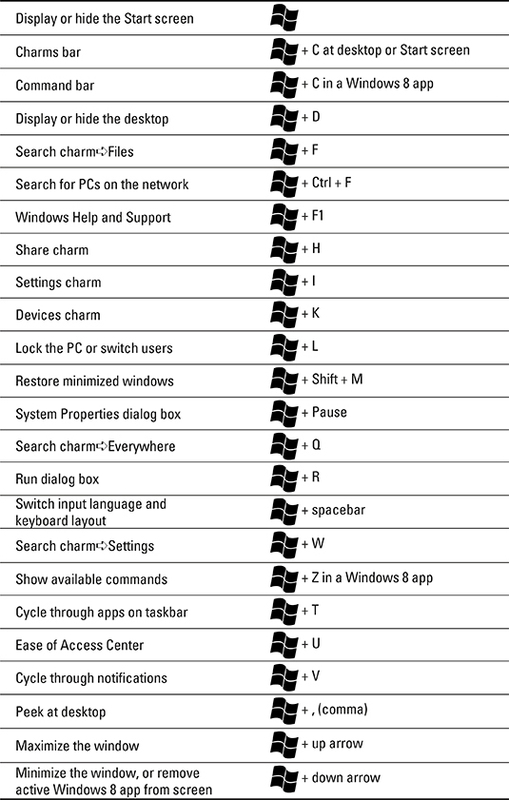 You can access a number of keyboard shortcuts by pressing the Windows logo key in combination with another key. You’ll be surprised by how much you can accomplish! In Microsoft Word, you can use a variety of keyboard shortcuts to apply formatting (including italics, bold, and underline); change the font or size of your text; or adjust the spacing and alignment of paragraphs. Anyone who works with Excel spreadsheets knows that they can become extremely long and complex. Here are some keyboard tricks for getting around in a spreadsheet quickly and easily. To Move . . .